We came back in 1942 after two years sheltering in Derbyshire – we went up in the back of a furniture van to stay with my aunt in a small Derbyshire mining village. This was after bombs had fallen near our house in Henley Crescent, Southend. My first memory being of Dad who had gone back to get Grandma’s spectacles just shutting the air raid shelter door when everything went orange outside with a great noise! So we rented a bungalow in Beresford Gardens, Hadleigh. 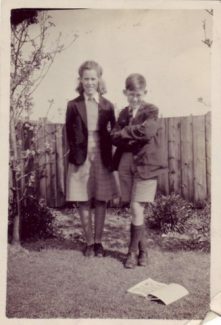 Pauline remembers thinking that at that time Hadleigh was a perfect picture of a village, church, pubs, little shops – butchers, smithy near the Waggon & Horses and what was the name of the grocery shop in the High street which used to send our shopping round on a box on the boy’s bike? (we would have a slice of cheese and a big bar of soap) We didn’t have a fridge – just kept milk covered up in the pantry which had marble-like shelves. We had an old anthracite boiler in the kitchen which heated the water and fires in the other rooms when needed – so hot in front and freezing behind. Going into the kitchen to make an evening drink required great courage – we used to scrape the ice off the inside of bedroom windows in the morning. We went to school at Beulah College – a private school along Kiln Road – the house is still there. My parents didn’t want us roughing it with the common children who went to the local primary school!! It was run by two brothers, Francis and Anthony Slattery. There were places for boys to sleep there I think. The school was odd in some way – I can remember not having any exercise books and doing our work on odd bits of paper. On occasion the Head would cane everybody because of some problem, though I remember him letting me off once. Pauline can remember Mr Slattery caning all the boys three times and the girls once at the beginning of the day to make sure we behaved! Sometimes we had classes up Shipwrights Drive – then a rough path across a field to a long thin building that had a heater with a chimney in the middle. I can remember writing down the date 4-4-44 and thinking I wonder where I will be when I write 5-5-55? (I was in fact taking an exam at College in Leicester). As far as the war goes I can remember hearing German bombers going overhead to bomb London – they seemed to go over regularly at seven in the evening. When doodle bugs started I can remember lying in bed hearing the warden shout “take cover” because the engine had stopped. I just lay in bed – we didn’t have a shelter there. My most vivid memory is one night when a very low V1 came over and it was so close to the roof that the whole bungalow shook. I was with my father in the living room – I just said “that was a near one daddy” he was standing there praying I think! Afterwards people said that it had skimmed the trees at Victoria House Corner. In the daytime we had the run of the village and used to go down to Hadleigh Castle. There were two shops selling pop on Castle Lane – one was cheap and nasty for 1d and the other better cost 2d! We would wander out on the marshes catching crabs. We used to buy a loaf of white bread and chew all the white soft part from the inside, and leave the crust. We would also go down to the beach at Southend, once it was cleared of the defences along it. I can remember going once to Hullbridge and saw in the distance the great constructions which were part of the Mulberry Harbour. We went for walks up the old Benfleet Road and there were lots of houses deserted there – posh people who had moved away for the war and we used to go and wander round the gardens and sometimes into the houses. We used to pretend that there were spies signalling from the window out to German ships in the river – most unlikely. There was of course little traffic – just the occasional long army convoy. My stepfather was stationed on Southend Pier and spent his time fishing and catching crabs and taking stuff from the NAAFI store – butter, sugar which he put in his overcoat pockets and brought to us. We must have had gas masks – I can still feel what it was like to put one on and what it smelt like and we had a stirrup pump as well – though what we used it for I don’t know. And of course we always had to put up the blackout every evening. I was never very aware of D Day but I do remember studing the maps of the fighting in Normandy in the Daily Telegraph which my father always bought. I have no memories of the end of the war beyond studying the maps of the allies advance, I remember seeing pictures of the American and Russian troops meeting in South Germany. I don’t remember anything about Auschwitz or the Holocaust. I must have seen pictures at the cinema. I don’t remember us doing anything about the end of the war. Did we do something at school? Certainly no street parties in Beresford Gardens – we didn’t know many people in the road. In 1945 I took the 11 plus and passed to go to Grammar School, but at the time my sight was quite bad, (it is said that they worked out that I couldn’t see well when I couldn’t see the barrage balloons in the sky. I can also remember seeing a film called the ‘White Feather’ and I didn’t understand what was going on). Anyway the nurse who inspected me irritated Mum by asking for me to come “can the little gentleman come now” because I went to the private Beulah College and not the local board school. She said I was not able to go to secondary school because of my bad sight – Mum had to fight to get that changed. It must have been after that that we went up to Moorfields Eye Hospital. The specialist there Dr Joels said my sight was pefectly good with glasses, as it has been ever since! After the war because people abroad had read my father’s books, some sent us food parcels. I can remember one from a lady in South Africa which was full of the most amazing foods that we had never eaten! Rationing of course as a child – all I was interested were the ‘personal points’ which could be used on sweets and chocolates. There was a sweetshop at Vic House Corner – run by an old man with what we called pebble glasses – very small and thick lenses. You get the idea sometimes these days that some older people would like to go back to the 1950’s and I wondered if they would put food and clothes rationing in their manifestos. It would solve the obesity problem overnight! Was it Brackens or Brackins grocery shop in the High Street, it had its own dairy behind the shop? I seem to remember that Mr. & Mrs Bracken were fond of ballroom dancing and were well-liked in the community. I lived in Homestead Gardens so it was a handy shop for us in the ‘Homesteads’.